Bridget Anzano, the president of the College Democrats, and Cole Perry, the chairman of College Republicans, set up a basketball game between the two groups in the Smith Center. 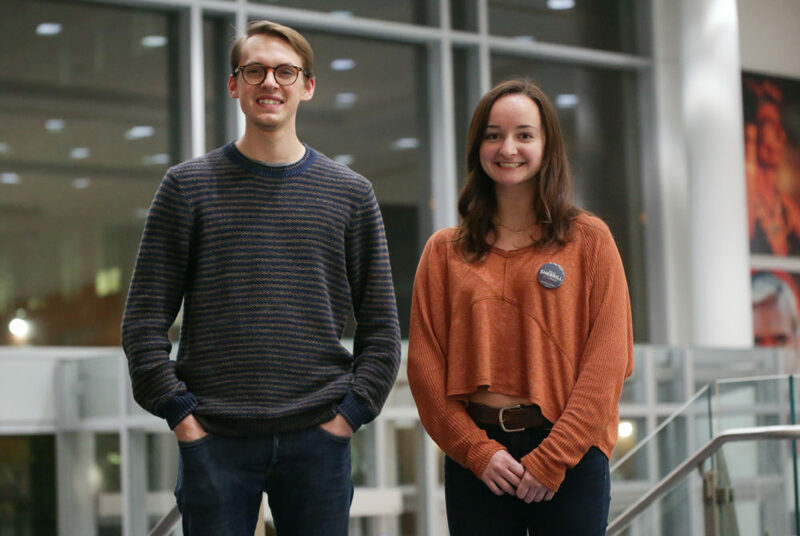 The University’s two most politically active student organizations aren’t just going head-to-head in the midterm elections. As Democrats and Republicans battle nationally for control of Congress’ chambers Tuesday, the GW College Democrats and College Republicans will dress in blue and red t-shirts for a basketball game in the Smith Center. Student leaders said the game shows the two groups’ ability to come together and have fun amid a highly anticipated and contentious election. Sophomore George Glass – the vice president of Colonial Army, the student fan section for varsity sports teams – said he initially reached out to the two groups more than a month ago with the idea of the “bipartisan” game during halftime of the men’s basketball home opener. He said that because politics is a central part of campus conversations, the game could be a good way to incorporate the elections into the start of basketball season. “People are going to care more about election night no matter what, so you might as well bring that to the game, which is what I did,” Glass said. Jackson Williams, the vice president of political affairs for the College Democrats, said the two organizations rarely associate with each other on election night. College Democrats hosted a watch party in the Marvin Center the night of the 2016 presidential election, while the College Republicans gathered in the City View Room in the Elliott School of International Affairs. Leading up to the elections, the College Democrats phone banked Monday and Tuesday and took an overnight trip to New Jersey’s 11th congressional district to canvass over the weekend. The group will also host a marathon phone bank in the Marvin Center from 9 a.m. to 7 p.m. Tuesday, Williams said. College Democrats will also host an election night watch party after the basketball game in a 150-person room in the Smith Center for the first time, he said. Bridget Anzano, the president of the College Democrats, said that one of the organizations is going to walk away Tuesday night feeling “pretty bummed,” so the basketball game is a way to lighten the mood. Cole Perry, the chairman of College Republicans, said the game is a way for the two groups to set aside political differences. Ahead of the election, College Republicans also canvassed Saturday in Virginia’s 10th congressional district for Republican incumbent Barbara Comstock, Perry said. The group will also watch the outcome of the Florida governor and Senate races, like Governor Larry Hogan of Maryland and the Wisconsin Senate race, Perry said. The College Republicans are also hosting a traditional election night watch party in the City View Room in the Elliott School after the basketball game at 8:30 p.m.